The crowd gathers for Jaws! 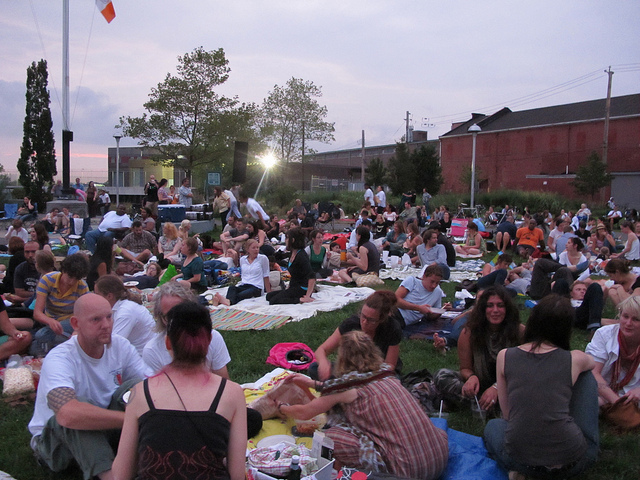 Thank you to everyone who came out for the Red Hook Films Summer 2010 season. We hope you had as amazing a time as we did. Remember the shark bike at Jaws? Or the screen falling over during Pirates of the Caribbean? Or having to show Cabin Boy inside Bait & Tackle? Even that damned ice cream truck seems amusing now. We’ll be back for summer 2011, so watch this site next spring for the new schedule. But, we are always looking to add more people to the organizing committee. If you’re interested in joining us next season, email redhookfilms@gmail.com. Bait & Tackle: Thank you for everything. For hosting the fundraiser. For showing Cabin Boy when it was raining. For helping to cover up those pesky lights. You were there for us all.summer.long. Brooklyn Ice House: Thank you for being with us all the way to the end. The brownies, mac and cheese and BBQ were worth it! Fairway:Thanks for bringing us the Princess & the Frog and showing that you support the Red Hook community. We don’t forget it. Fort Defiance: You were our rain sponsor and got lucky that it was such a clear and beautiful summer. But nonetheless, we appreciated that you were there for us if we needed you. Even on your one night off. Good Fork: Those bento boxes were amazing. And you totally rolled with the bad weather for your Cabin Boy night. And helped make it perfect and cozy inside Bait & Tackle. Plus, it was always great to see your smiling faces as we were setting up. Movers Not Shakers: Thanks for your faith in the series and being the first to sign on — and host the very first night. It means so much. Home/Made: Popcorn! Popcorn! Popcorn! How can we thank you enough for spending hours every Tuesday popping us dozens of bags of popcorn? Each night was a bigger success because you were there for us. O’Connell Organization: You signed on to this project immediately and provided moral support through the summer. Thank you for being there and giving back to the Red Hook community. Pickett Furniture: You’re a small business in the middle of tough times. Yet you stepped up and helped us keep this series alive. That is so heart-warming. Red Hook Community Justice Center: Of course, we couldn’t do this series without you. Red Hook is so lucky to have you all. Red Hook Lobster Pound: You totally got the community spirit of this event and came out to do lobster rolls during Deep Blue Sea, despite it being your one night off. We can’t thank you enough! Botta di Vino, Metal and Thread, Dry Dock Wine + Spirits, Foxy & Winston, Red Lipstick, Tiburon, Uncle Louie G: Thank you for your support. It was so touching that all of you belived in Red Hook Films enough to join forces and sponsor Splash. It is tough times all around, and your collaboration to help us was so inspiring.